Fantastic news! We've long known that James McAvoy and Michael Fassbender would be returning for the sequel to X-Men First Class — but now we know that we'll also be seeing the older versions of Professor X and Magneto! 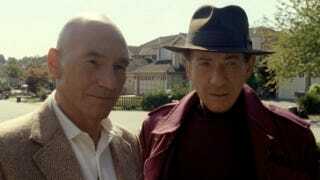 Director Bryan Singer has confirmed on his on his twitter account that he is, "Thrilled to announce @ianmckellen118 & @SirPatStew are joining the cast of #XMEN #DaysOfFuturePast #magneto #professorX More to come..."
TWIST! Singer also confirmed the return of Fassbender, James McAvoy, Jennifer Lawrence and Nicholas Hoult — but we're a bit more buzzed about the Ian McKellen and Patrick Stewart business. How will Singer and company pull this off? We can't imagine that they would spoil a surprise cameo this early in the game, which makes us believe that McKellen and Stewart might have a fairly big on screen presence in X-Men: Days of Future Past. If it follows the comics closely, Days of Future Past will no doubt visit a dystopian future where mutants are oppressed by humans. Is it possible that in that version of the future, Professor X didn't die in The Last Stand, and Magneto is fully powered up? Will the audience spend half of their time in the future and the other back with the younger versions of Eric Lehnsherr and Charles Xavier? It's possible. In other news, Ian McKellen has a Twitter account!